As you may have heard on Sunday, 40,000 runners are going to be winding through the five boroughs for the 39th NYC marathon. Suffice it to say you will not be among them. The only running you'll be doing is out of booze. While they are out there suffering needlessly there are plenty of places along the 26.2 miles where you can stay warm and drunk and still feel like you're part of the action. Even if you are cheering on a friend there is no need to spend hours waiting in the cold for the chance to hold up that "you go girl" sign: Time Warner has made it possible for you to get real time updates of your runner's progress. Just enter her bib number in advance and you'll know just when to duck out of the bar. 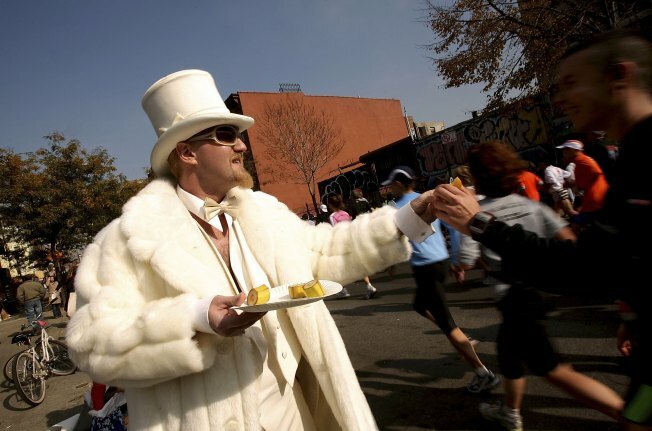 Bedford Ave in Williamsburg is a key spot for prime viewing for both runners and people in silly outfits all day long. The course runs the length of Bedford, jagging north just as the runners come through Carrol Gardens and staying on track until they hit Manhattan Ave in Greenpoint. They hit south Williamsburg at about mile 10, so this is a good point in the race to see your friend. She's not hobbling pathetically like she will be on the Upper West Side and you don't have to wait around on the Upper West Side. Plus there is a band playing outside about every two blocks. Not to mention the impromptu dance party at the NYC poolhouse on Metropolitan and Bedford. Why not start off with a build-your-own Bloody Mary at the S. 4th Street Cafe on S 4th and Berry? But do this early as it is a block off the route. Then head over to Lenora's Way on Bedford and S 2nd, a good beer bar that keeps 10 beers on tap and ridiculous number more in bottles and cans. The lovely thing about this stretch of the race is you never have to lose sight of the street to get a drink -- though when the course is thick with runners it can be a challenge to get across, so you may want to set up somewhere that offers that the best views and that is open early like Spike Hill on Bedford and N. 6, which -- considering view, drink selection, other distractions and quality of brunch -- is probably one of the single best locations from which to watch the marathon. This spot has a window that is open to the street so you can perch your beer on the ledge and yell your "You go girl"s from the comfort of your stool and still be heard. That is, if the Delay playing across the street don't drown you out. Right next door to Spike Hill you can pop into Greenpoint Tavern, which offers 32 oz Styrofoam cups of beer for $3.50 if you are on a budget. Up the block a bit If you elect to cross the street, Mugs Ale House on the east side of Bedford has, as the name implies, a nice selection of beers and some bar food as well. At both of these you'll have a window with varying views of the action, but no one will be able to hear you scream.